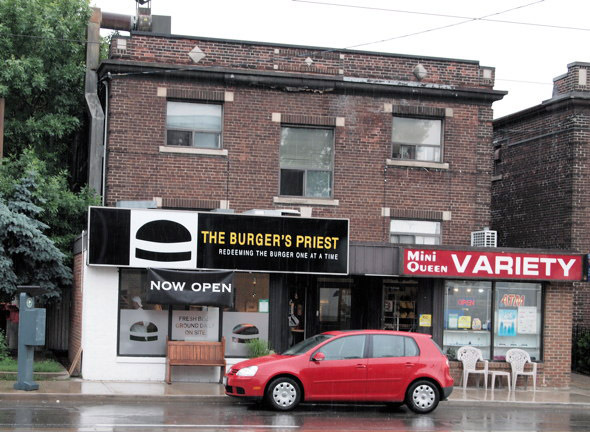 The Burger's Priest, near Queen and Coxwell, stands defiantly between a McDonald's and a Harvey's. It's on a mission to redeem the burger one at a time . Open for a couple of weeks now, this tiny cash-only take-out joint has already won over locals. On a recent visit there was a steady stream of customers and the cooks were kept busy flipping burgers throughout the lunch hour. To keep customers occupied while waiting for the food, the owners have decorated the restaurant's walls with photos of famed burger joints from around the world as a sort of homage to the art of a good burger. The overall vibe here is spartan, unpretentious and convivial. It's clearly all about the burgers and how to best enjoy them. 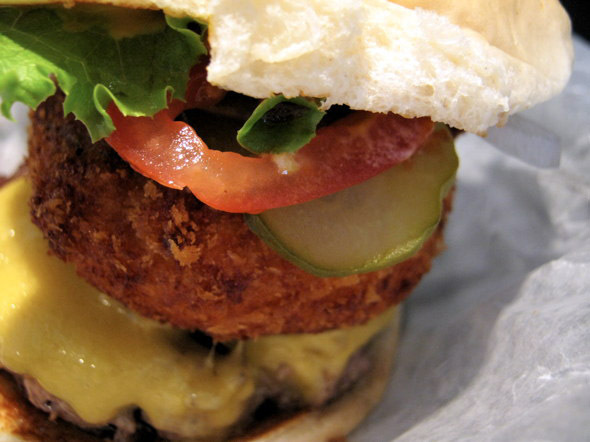 An efficient and friendly two-man operation, the Burger's Priest keeps things simple by offering a pared down menu. The beef they use is fresh ground in small batches throughout the day and it's supposedly never frozen. As has become the trend recently, they also ask you how you want your burger done - and if you don't mind if it's a little pink on the inside. During my first visit, I went for the Double-Double ($7.99) which is likely inspired by In-N-Out Burger's two patty, two cheese affair. The guy who took our order told us the burger's beef was ground just an hour earlier. I ordered it with everything on - slivered onions, pickle relish, ketchup, lettuce, sliced tomatoes and two slices of perfectly melted cheese. 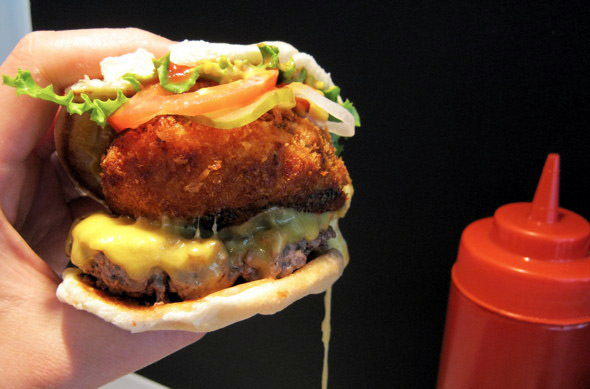 The burger itself isn't too large and is held together by a rather unremarkable plain bun. 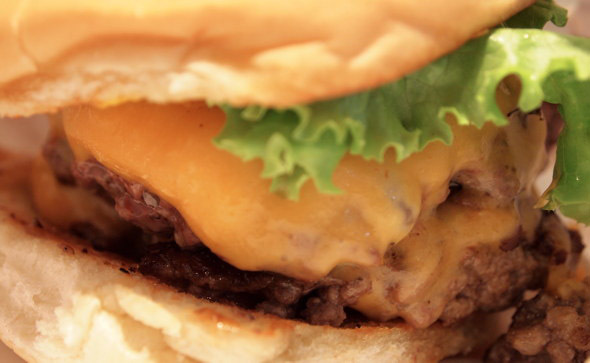 But the patties are amazingly soft and almost creamy. Hot off the grill, it tastes superb and despite being smaller than what I'd prefer, it's surprisingly filling. There's something to be said for freshly ground and grilled beef. Om nom nom nom. As anyone knows though, it doesn't matter how good a burger place grills their patties if they can't master the art of fries. The fries here are sliced skinny and are tasty but I found them a bit soggy and oily for my taste. 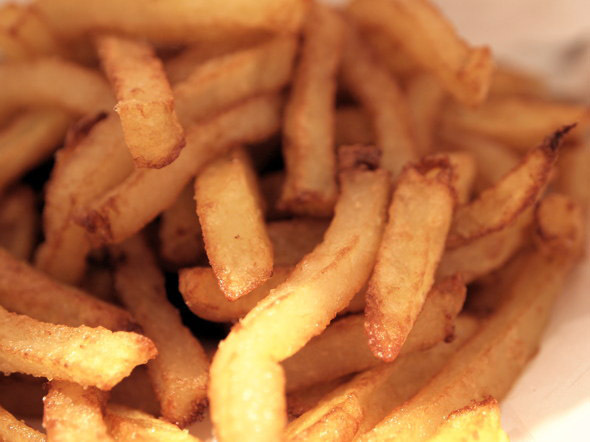 It's just a matter of preference, but I like my fries crispy and a bit thick, especially if I'm getting take-out and won't be eating them until a little later. A few days later I return for The Priest ($9.99) which is a best-of-both-world's choice that has The Option paired with a cheeseburger. This was bigger than the Double-Double and loaded with cheese which began to seep out once I picked it up. The heady combination of beef, mushrooms and cheese is stacked high, difficult to handle but is bursting with flavour and cheese. Pass the Lipitor, please. Overall, my verdict is that The Burger's Priest really does make much better than average burgers and they are different from anything I've found in Toronto. Firm up the fries; add some milkshakes and I'll be coming back regularly for more. Hours: 11:30 am to 11:00 PM (or until food runs out). There are a limited number of stools for a handful of dine-in patrons although most customers take things to go.